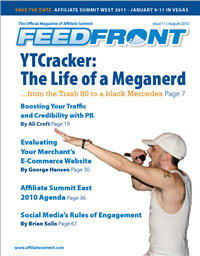 Bryce Case, Jr. (aka YTCracker), who was featured on the cover of issue 11 of FeedFront magazine, has launched a new cpa network called NERD LIFE media. Usually, the launch of a new network in the already overcrowded landscape would be something of a scourge, but this one has an interesting angle. YTCracker is not only into affiliate marketing; he’s also a Nerdcore rapper who has put out a lot of entertaining music – check out his latest album, “Space Mission,” on iTunes. 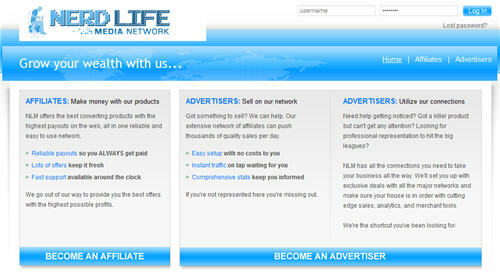 He announced NERD LIFE media on his Digital Gangster forum and how he plans to bring his fans into the network. i have a unique opportunity to be the first rapper to actually make money *with* my fans rather than off of them. sure, someone rapping about selling coke and busting guns might have a few people that hit their favorite rapper on the low and cross their fingers that they get plugged into the downline, but you can’t exactly be proud and public with something like that (unless you also rap). rmk says that you can never guarantee a stress-free life, but you can guarantee you will *constantly* have stress in your life if you are always riding dirty. we have acquired the resources and dataset required to help our people build sustainable, legal, and stress-light solutions for anyone who wants to join us in our pursuit of the greatest life possible.